China wants to dominate semiconductors, and vertically integrate manufacturing. This is a global threat on many fronts. Ray Zinn, founder of Micrel Semiconductor, discusses why and what to do about it. Guy Smith: Welcome back to the Tough Things First podcast. This is kind of a special edition for us. My name is Guy Smith. I’m your guest host today, and of course, we’re chatting with Ray Zinn, the longest serving CEO in all of Silicon Valley, and good morning to you, Ray. Ray Zinn: Well, good morning to you, Guy. It’s a beautiful day outside here. Guy Smith: It certainly is. Hey, listen, I want to dive right into this topic because I noticed that you wrote an article for Forbes magazine discussing China, semiconductors, the future of global economics, and I find this kind of a fascinating topic because we’re seeing some, what I would consider tectonic shifts in terms of the way technology is aggregated worldwide, and I know that you’ve got some interesting insights, so let’s just dive right in. Why are semiconductors so important to mainland China? What is their longterm gain here? Ray Zinn: Well, if you recall, going back after the second World War, we were trying to get Japan back on its feet and so, we introduced the automobile to them, and of course, you saw what happened. They took off and became the world’s giant automobile manufacturer. Well, in 2001, roughly there when the dot com implosion occurred, a lot of the manufacturers decided to move their electronic manufacturing to Asia because number one, they weren’t cost competitive, and since the fall off in the dot com caused the manufacturers then to really lose a lot of money, and these are electronic manufacturers such as … Can’t remember the name of the company now because they’re no longer in existence, but the number of these large manufacturers shut down their manufacturing in North America and Europe and moved to Asian countries. The biggest of course, was China, mainland China, and so when mainland China looked at the list of product that goes into an electronic product, it’s semiconductors, and so they thought well, we can gain a great foothold here if we can manufacture the majority of the components for the electronic system. And since semiconductors were the mainstay, that became a focal point for China, and they decided hey, we’re going to become like Japan was back in the 40s and 50s. We’re going to become, China’s decided to become the go-to country for electronics. And a lot of the contract manufacturers, like Flextronics and the likes, moved to China and set up these large electronic manufacturing plants in China. 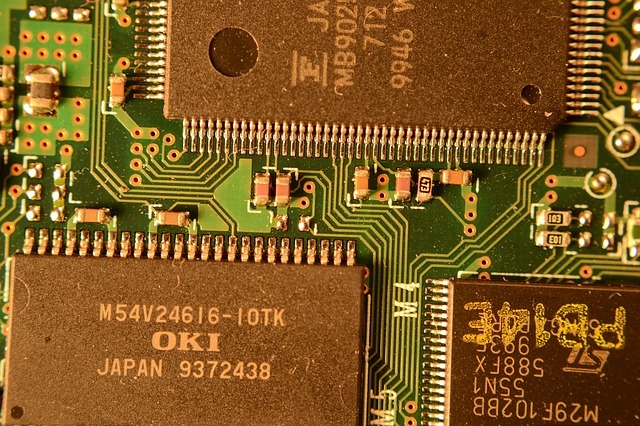 So a few years ago, we learned that China’s main goal or one of their stated goals is to be able to supply nearly all, 100 percent or nearly all of the semiconductor content directly from China, meaning that China would be the source for the semiconductor components and for that matter other components, passives and so forth for the electronic system. And they’ve been working frantically to do that to get their goal accomplished by 2025, and so the country, the government sourced and funding over 18 billion dollars to acquire semiconductor technology, and they are frantically doing that to this very day. Guy Smith: Wow, and I think that’s one of the fascinating things about the market mechanics at the moment because even though mainland China is a manufacturing behemoth and they’re grinding out gadgets for the entire world, they have to import most of their chips in order to build iPhones and whatnot. And so basically they’re trying to do two things vertically integrate by building more of their own semiconductors, but there’s a political aspect in that Taiwan, who they have this adversarial relationship with, is really one of the powerhouses in semiconductor manufacturing, so by vertically integrating, they end up keeping more of the money and they knock the legs out from underneath a political rival there in Asia. Ray Zinn: That’s correct. The Taiwan semiconductor manufacturing facilities, they’re actually called Taiwan Semiconductor, is one of the largest semiconductor manufacturing plants in the entire world. They have three or four semiconductor plants spread out over the country of Taiwan, and they are the go-to place for most of the high tech firms like Broadcom and Cisco and some of the other large consumers of semiconductor components, so nearly all the main, entailing all the main semiconductor manufacturers, do use TSMC for their semiconductor components, and obviously, China’s trying to capture their unfair share of that capability, which is currently shared by, or held by Taiwan. Guy Smith: So do you see mainland China actually making their goals by, I think you said it was 2024 and if so, what then becomes their role in the global marketplace in terms of manufacturing and selling semiconductors? Ray Zinn: There’s two parts in manufacturing semiconductors. One is the facilities themselves, the plants to make the product, but there’s also the design component of it, and somebody’s got to design the product, and that’s where they lack a lot. So does Taiwan. The design capability to do that. Now, with design automation, at least in digital semiconductors, becoming more viable, they can design their own semiconductor products using these automated design tools. Again mainly for digital semiconductor products, which probably comprise of, 80 percent of all semiconductors are digital. Memory and microprocessors and the like are digital-type products. So that, they can probably do through design automation, but somebody’s got to come up with the requirements. Somebody’s got to say, “Well, here’s what I want,” and China is not that way. They don’t necessarily start out saying, “Okay, here’s what the world wants.” They’re more in terms of “Tell us what you want and we’ll build it,” type of thing. So the innovation, I don’t think is there as much as it is in the US. So the US is kind of the innovators of the product and then China mainland would be the manufacturers of it. Guy Smith: Well, that brings up another interesting geopolitical reality. I’ve noticed that a number of American companies have been investing in design and innovation centers in India, everyone from Apple to Ford Motor Company, and there have been a lot of reasons why they’ve justified these investments in India. Given China’s disposition to go manufacture what other people tell them that they want, and American industry’s investing in India for design, do you think there might be a split in the Asian market that a lot of the design work will eventually float to India, but the manufacturing will float to China? Ray Zinn: Could be. I’m not sure. It certainly, India, which could be the third largest economy in the next ten years, has come online quickly, and they’re a very well-educated society, and certainly they have the potential to do that, but I’m hoping anyway that the US wakes up and says, “We can’t just let the rest of the world do our thinking for us, and we got to do some thinking for ourselves,” and so we still can maintain the edge on making electronic components and products as opposed just to giving it all away to other countries. Unfortunately, we did this to Japan in the 50s, and we’re paying the price for that today, so I’m hoping that this doesn’t happen, that the US government recognizes the flaw in that thinking, that all we’re going to do is just be somehow a consumer of things as opposed to a producer. Guy Smith: Well, and that brings up an interesting point because we are the world’s largest consumer of electronic gadgets. China’s manufacturing wealth is all, well not all, but largely contributed by the United States, because we buy the products that they manufacture. So is China going to have to play nice with the US, especially given the current administration’s willingness to impose trade sanctions where they think appropriate? Ray Zinn: Well, I mean, China is willing to fire back, so I’m not sure how much we have frightened them as you would, so China’s become a large consumer of electronics themselves because their country is growing in wealth and capability, and their populace is now becoming a huge consumer of electronics, such as India is also getting on the same track. So, they will ultimately have a large, China mainland, that is, will have a large consumer base within their own country. They are many times bigger than the US size-wise. Now, more than three times our population, and so they have a large pent up demand in their country. I’m not sure how much clout the US is going to have. What I can worry about is just the security and the capability of protecting ourselves, because electronics go more into than just into consumer products, they go into military and aerospace-type systems. So, I’m hoping we retain that technology and the ability to protect ourselves. Guy Smith: Well, not only retaining the technology itself, but having some sort of leading edge expertise in it. A lot of people noted that Japan figured out how to make automobiles a lot better than Detroit was making them, and when you compare Japanese manufacturing down to the suburbs of Detroit you can almost see visually what the net outcome after a couple of decades of that economic shift was, and now Japan is building factories in the US for a variety of reasons, but they still are the ones who are innovating the marketplace probably most. So, if China does indeed build a capacity to dominate the semi industry, what does this mean to the world economic order? I mean, there’s the military, this national security aspect that you just mentioned, but does it also put a wrinkle into the total economic fabric? Ray Zinn: Well, I hate to say this, maybe because I’m a semiconductor veteran, but so goes semiconductors, so goes the world, and I’m not sure everybody who listens to this podcast is going to agree with me, but since our world is highly electronic based and semiconductors are the hub of that electronic base, I say so goes semiconductors, so goes the world. So if we want to give up our world leadership, and certainly we’re on that road to do so by just letting everybody else manufacture semiconductors and the developing that technology. Guy Smith: Is there any movement with inside the American semiconductor industry to try to bring more of the work home? Ray Zinn: I don’t see it yet. It’ll have to happen. Intel used to be the world’s largest manufacturer of semiconductors and now it’s Samsung, and that’s a Korean company, and so I’m not sure what Intel’s going to do, or others are going to do to get that back. IBM sold off their PC or their consumer computer systems manufacturing to a company called Lenovo. I think it’s called Lenovo in China, but we’re rapidly giving away the technology much like we did in the 50s to Japan with automobiles. So, it can happen, and it can happen very quickly. If you remember, I don’t know if you remember because you’re probably not old enough, but there used to be a cartoon series, Lil Abner, and there used to be, General Blue Moose was General Motors, and General Motors, you know, there was a saying, it used be so goes General Motors, so goes the world. And General Motors, of course, is now no longer the powerhouse and even in automotives, they’re no longer the powerhouse. I think Toyota is. Once we go down that slippery slope of giving away these technologies, much like we did in the automobile industry, we’re going to be a second rate nation. And so we need to wake up and put a halt to this. Otherwise, we are going to lose. Apple by the way is currently the world’s largest user of semiconductors, and now look what’s happening. They’re manufacturing nearly all of their products in mainland China. So, this trend has to change, or we are going to lose our edge. Guy Smith: It doesn’t bode well, but I don’t think we’re so far into the ditch that we can’t pull ourselves out, but I think it requires social will as well as political will to make that happen. Well, thank you, Ray. I appreciate it, as again, always insightful on multiple different levels, and for the audience, whatever you do make sure to subscribe to the Tough Things First podcast. You can do that on iTunes, Google Play Music, Stitcher, all the usual outlets, and if you haven’t yet, you absolutely have to get a copy of Ray’s book, Tough Things First. If you’re looking for a head to shoulders review of management, leadership, and business philosophy, especially from the entrepreneurial perspective, you can’t do better than Tough Things First. So thanks again, Ray. Always a pleasure. Ray Zinn: Thanks, Guy. I’m always glad to be with you, hosting these podcasts. You give me cause for thinking, and that’s good. Guy Smith: Wonderful. Well, we’ll chat again soon.